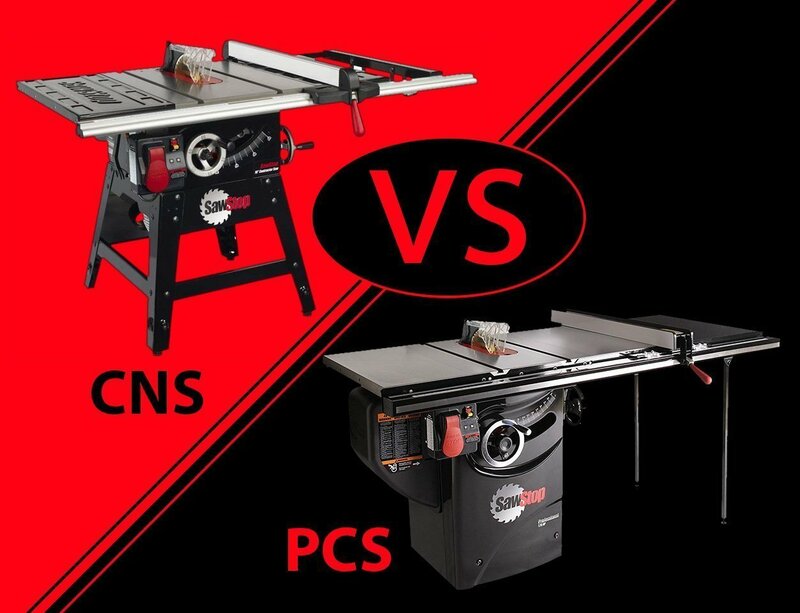 Home›Tutorials›Table Saw Enhancement – Converting Extension Table Into Router Table. 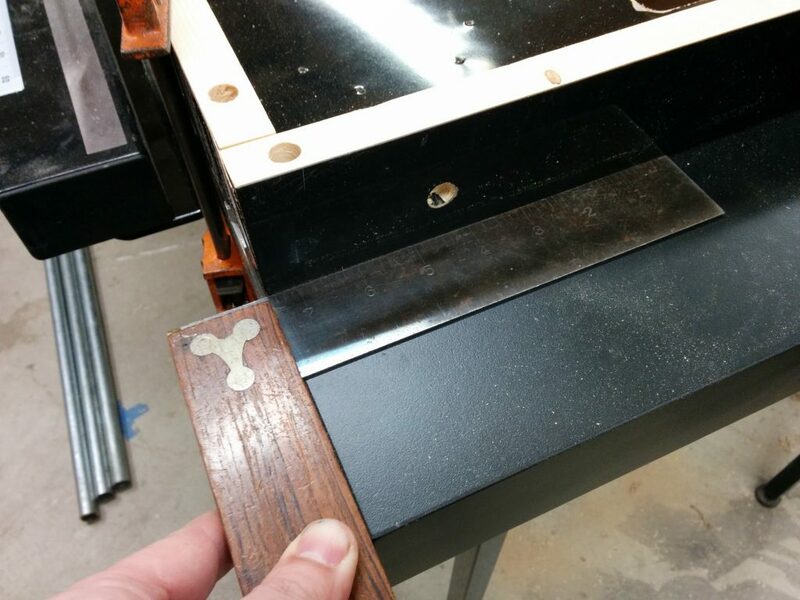 This is a continuation of my other table saw enhancements, Attaching a Sliding Crosscut Table Without Cutting Down the Rails and Attaching an Extra Cast-Iron Extension Wing. 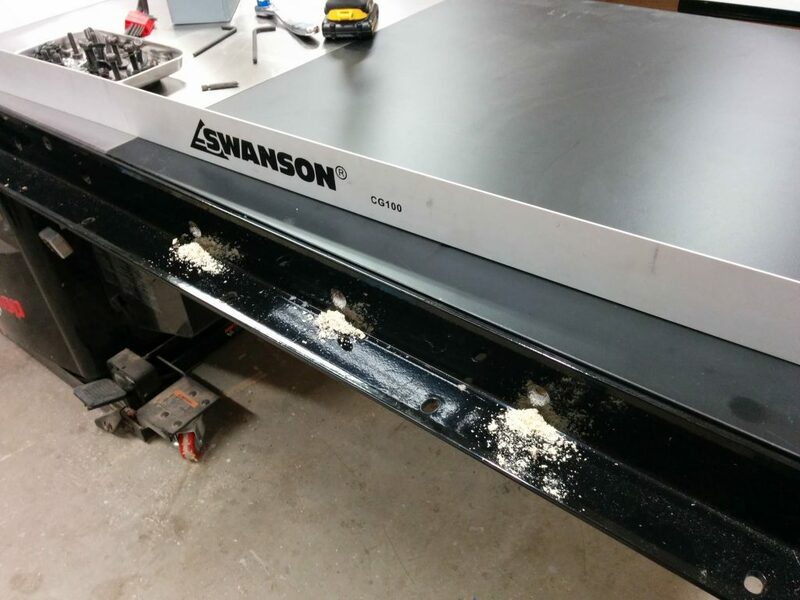 The additional cast iron wing that I attached to my table saw moved the wooden extension table another 10″ past the end of my rails. 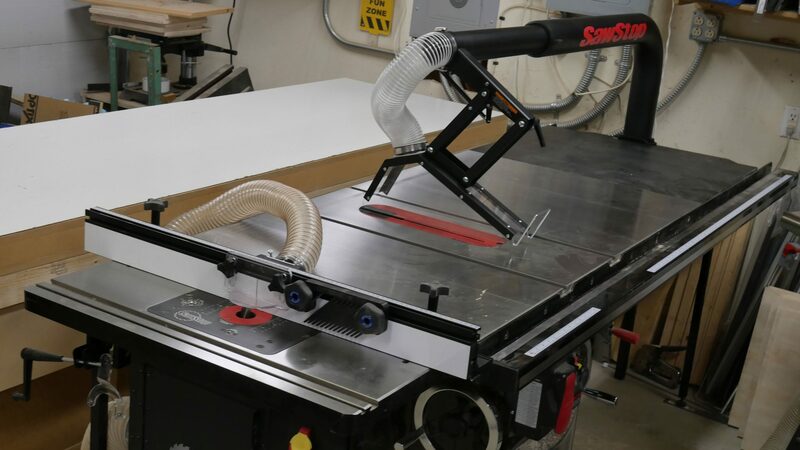 This allows me to relocate my router table to the far-right edge of the table saw without having to cut notches in my front and rear rails to accommodate the miter slot. 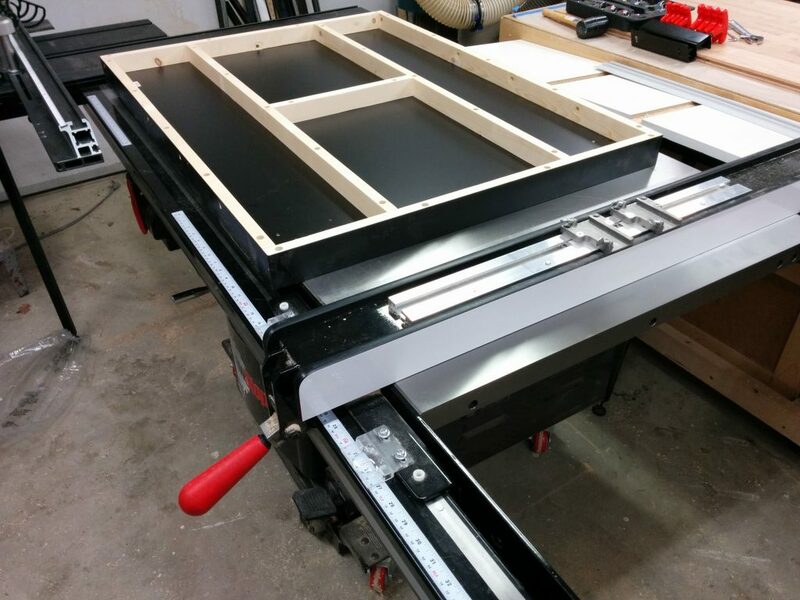 Converting the extension table into a router table. I had to remove my fence in order to attach the additional cast iron wing. 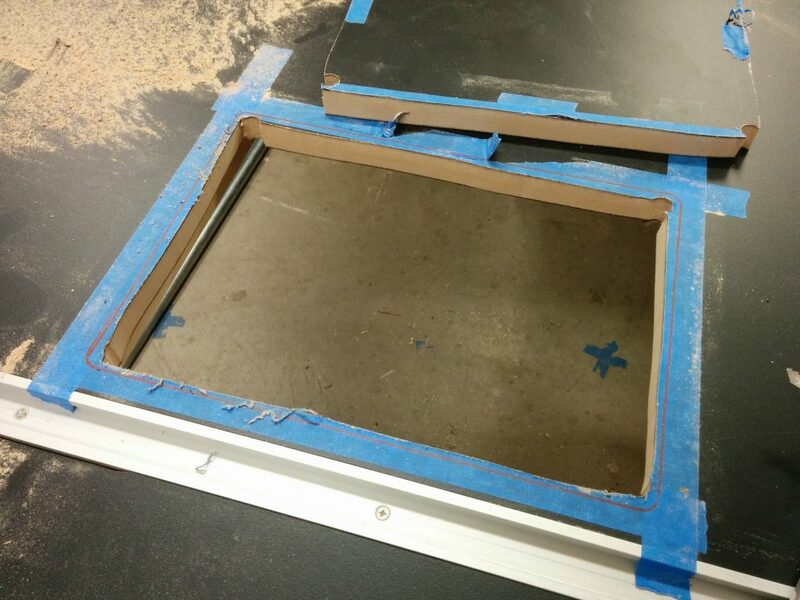 I didn’t want to put my fence back on yet but I realized that I needed to so I can cut a dado in the wooden extension table for the miter slot. This is the same extension table that I had previously removed. I temporarily reattached the front rail and did a quick fence alignment so my cut would be parallel with the edge of the table. This led to a slight problem as you’ll soon see. Temporarily reattached the front tube so I can use the fence to cut a dado in the extension table. 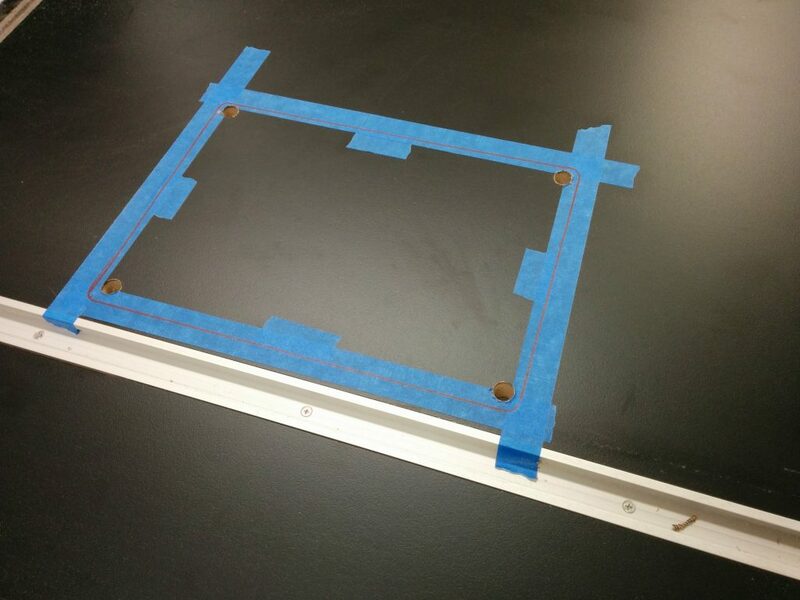 I wanted to make sure I didn’t accidentally cut through any screws so I removed the legs for the table. 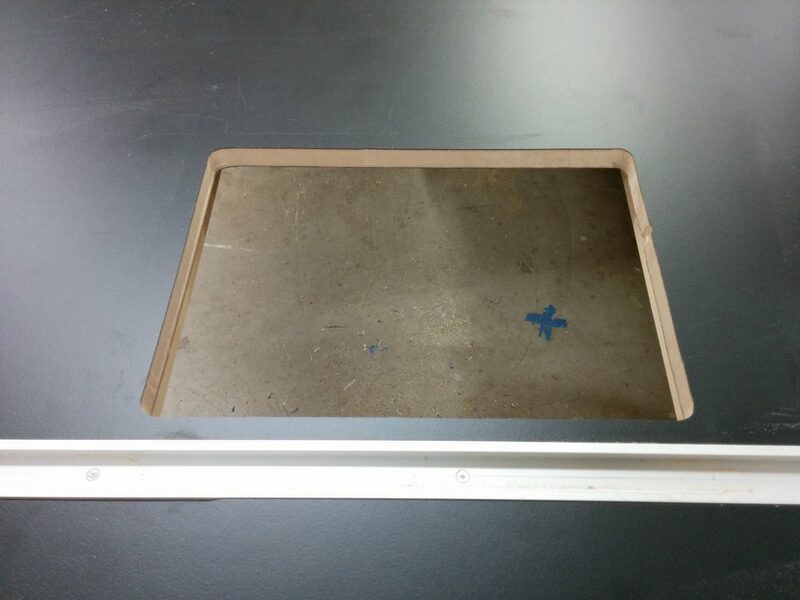 I figured that I would make the miter track 6″ from the edge of the table. This would ensure that I didn’t hit any screws while cutting the dado. I wasn’t worried about hitting a screw and activating the brake in the SawStop since a screw by itself is too small to activate the safety system. I mainly didn’t want to mess up the carbides on my dado stack. I positioned the fence at the 6″ mark. 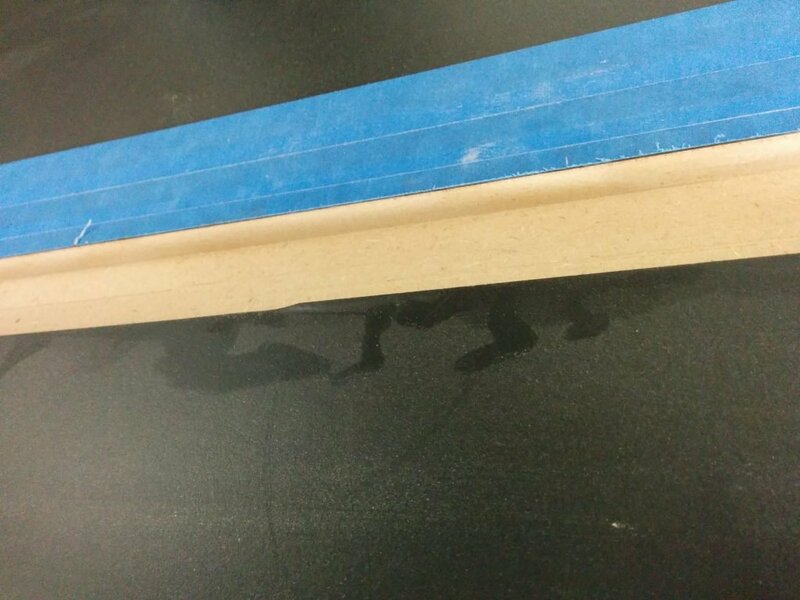 I applied some blue painters tape to help prevent chipping and scratching the laminate on the edges of the dado. In keeping with tradition, I miscalculated where I should put the tape. You’ll see what I mean in a second. Taping where I’ll be cutting. 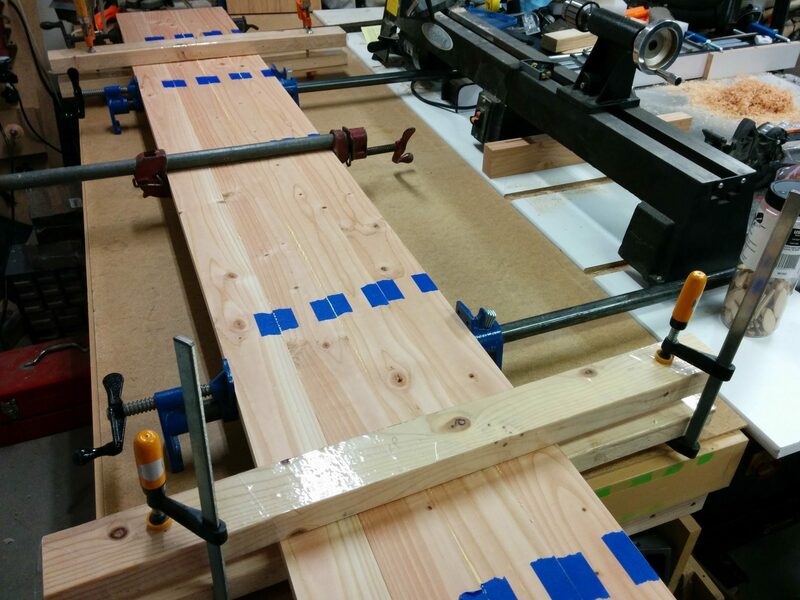 I clamped some scrap wood on the side of the table to help prevent tear-out. I made sure the clamps were positioned where they wouldn’t get hit by the blades. Clamping some scrap wood to help prevent tearout. 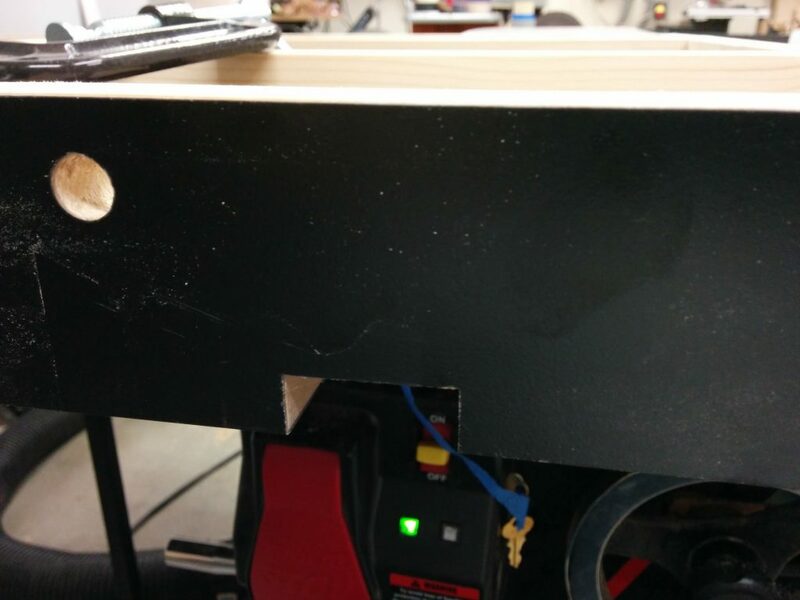 I lowered the dado stack so it would make a scoring cut first. 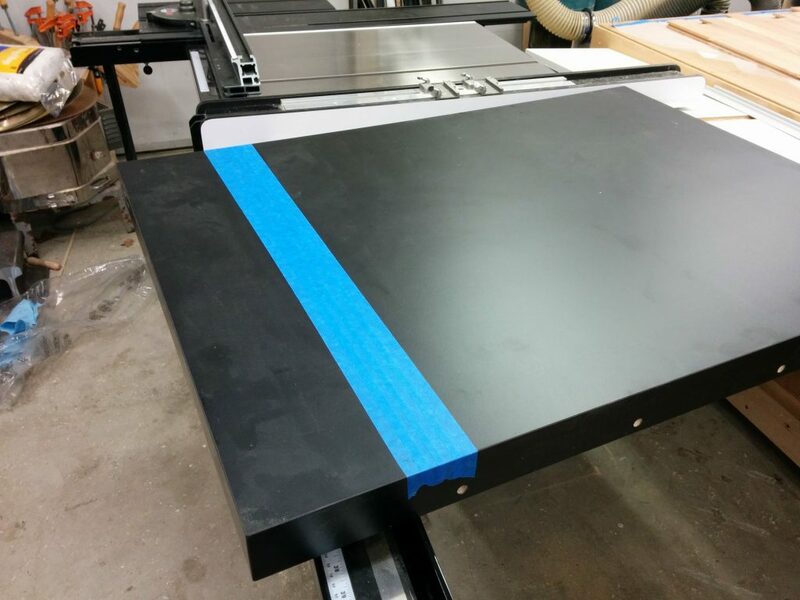 This is another step that can really help prevent the edge of the laminate from chipping. 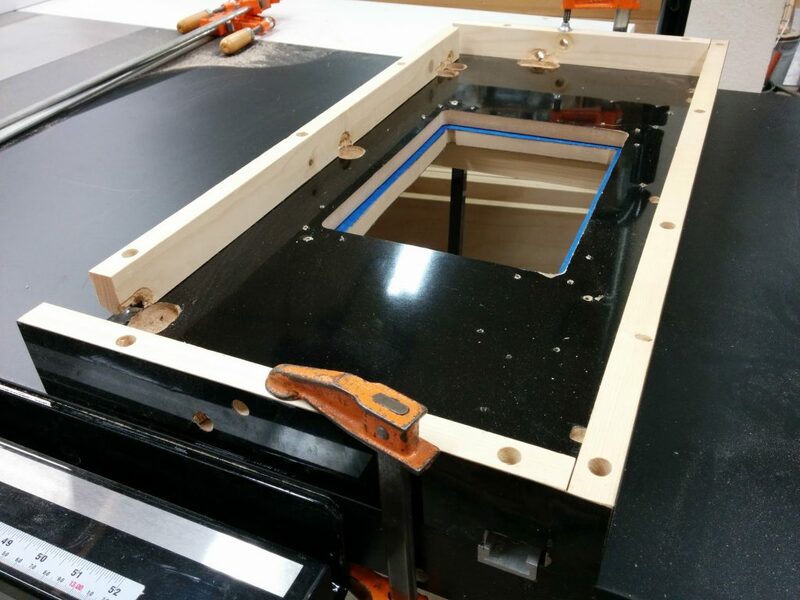 Lowering the dado stack so it”ll just cut through the laminate. I made my first pass. 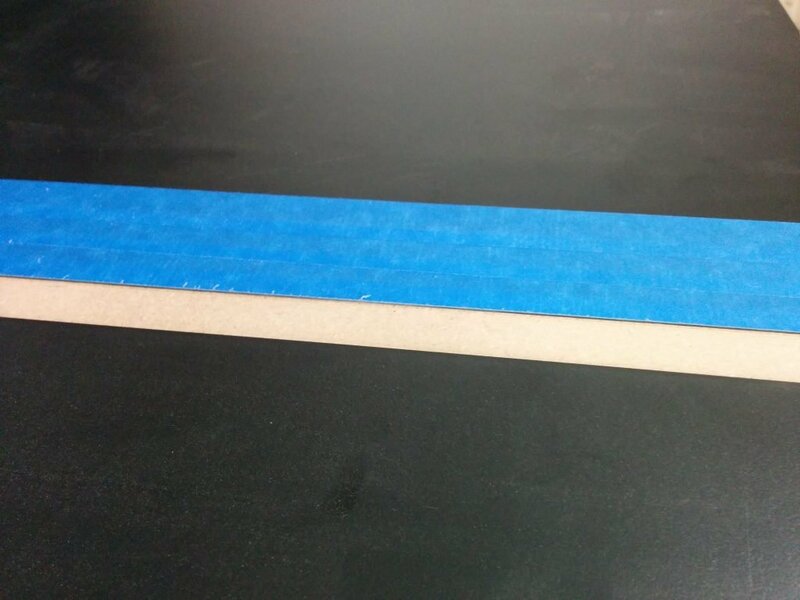 As you can see, the blue tape wasn’t positioned correctly so my first cut didn’t have tape on each edge. As it turns out this wasn’t a big deal. 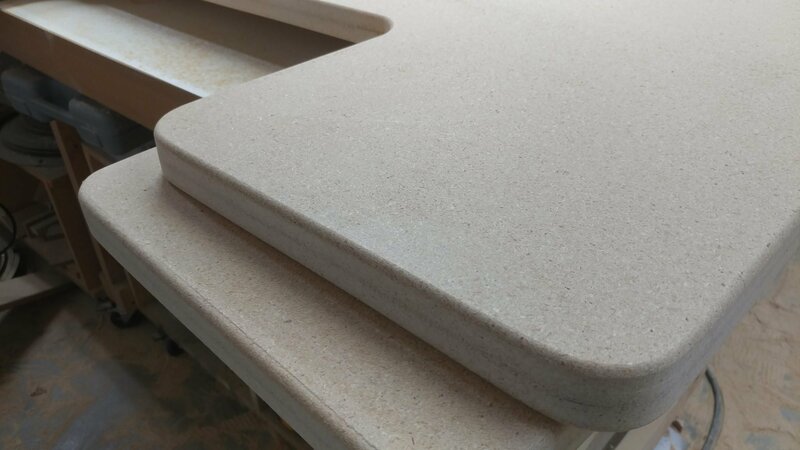 The laminate that SawStop recently switched to for use on their extension tables is some high-quality stuff and didn’t tear out at all. I didn’t have similar luck with the laminate for their older extension tables. Didn’t position the tape correctly but it didn’t matter in the end. Here you’ll see one of the areas where I screwed up. Remember when I said I did a “quick fence alignment”? Well, I should have taken my time. If I had, I would have noticed that in aligning my fence I also slightly loosened the clamping pressure of the fence on the front tube. This caused my fence to slide a little bit as I was cutting and caused a slight unevenness in the dado. Fence shifted while making this cut. 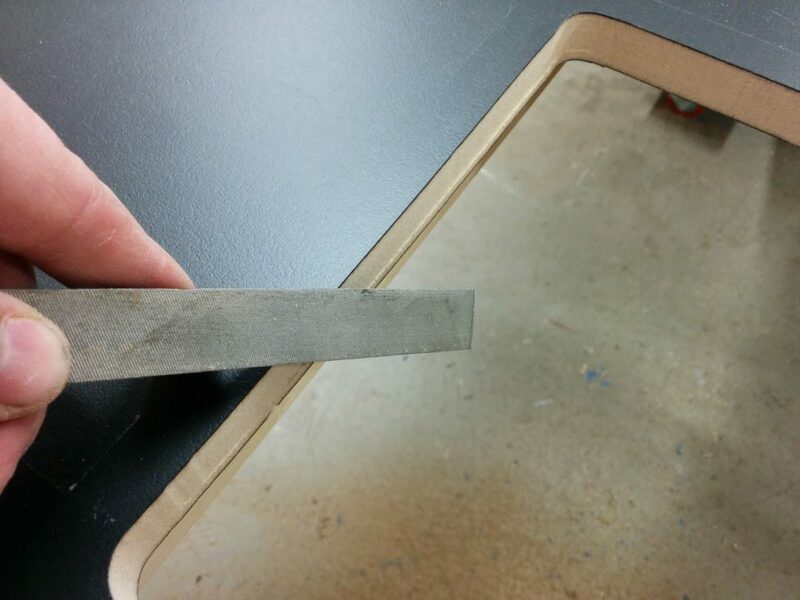 As you can see, the scrap wood kept the laminate from chipping on the edge. I reattached the legs and temporarily clamped the extension table to the rails and the right wing, making sure it was flush. 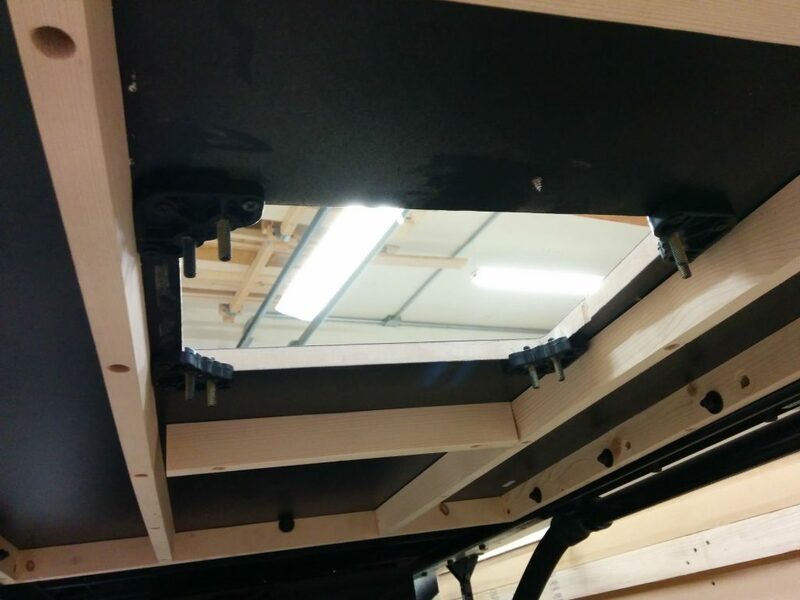 Then I drilled new holes through the sides of the wooden extension table for the bolts to attach it to the rails. 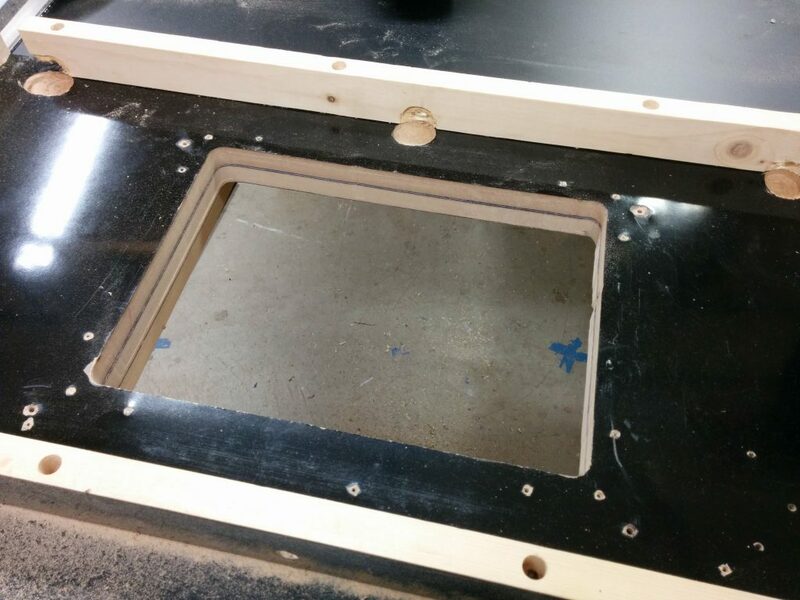 Lined up the table and drilled holes for the mounting bolts. I then did the same thing on the back. 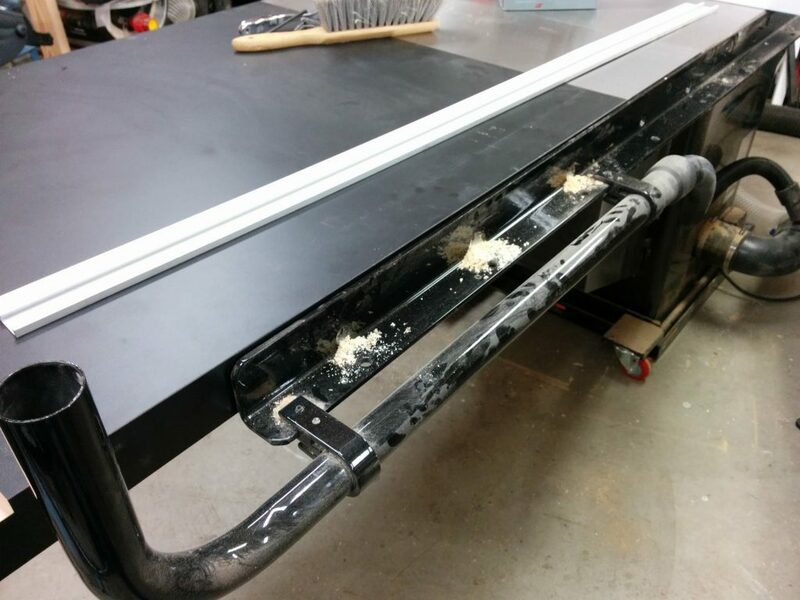 After the holes were drilled, I reattached the table to the rails using the appropriate bolts, washers, and nuts. 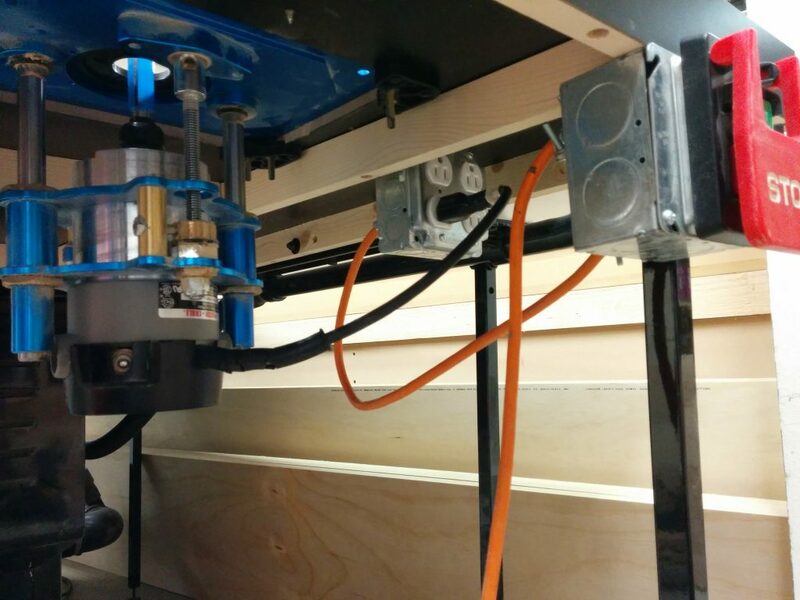 Drilled the mounting holes on the back of the extension table. 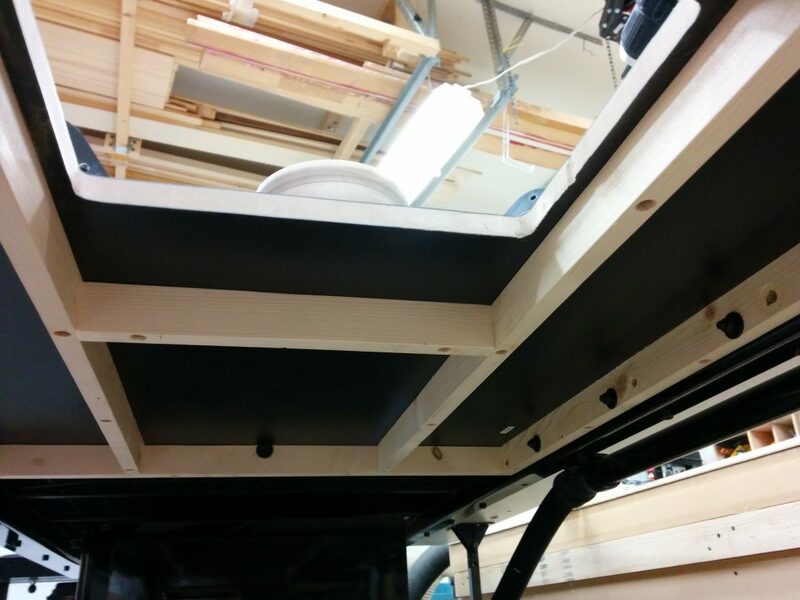 I then reattached my outfeed table to the rear rail. Now it’s time to mark the opening that I’ll be removing. I’m going to remove most of it with my jigsaw then clean up the rest with my trim router and a pattern bit. 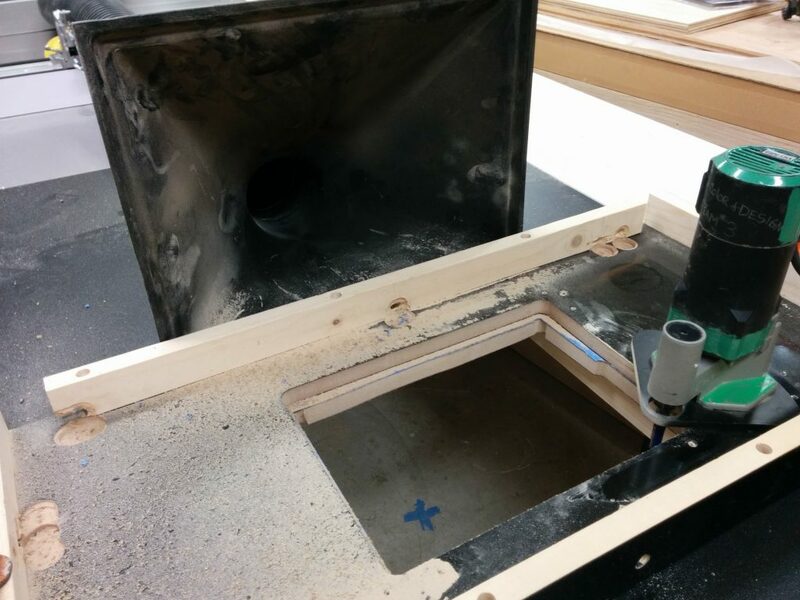 Using the old router table as a template. 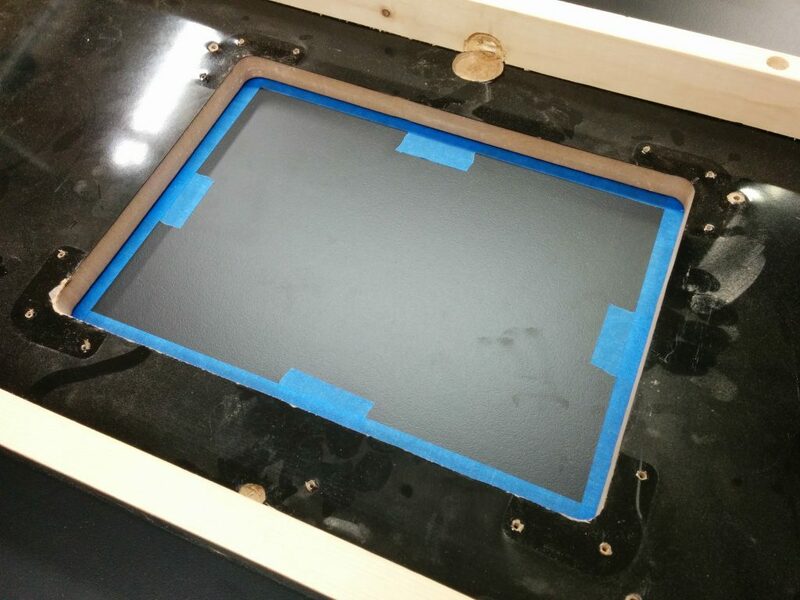 I laid the pattern on the tabletop in the spot where I am going to remove the material. Absolute precision is not critical at this point. I used a few pieces of painters tape to mark the inner edges of the opening. 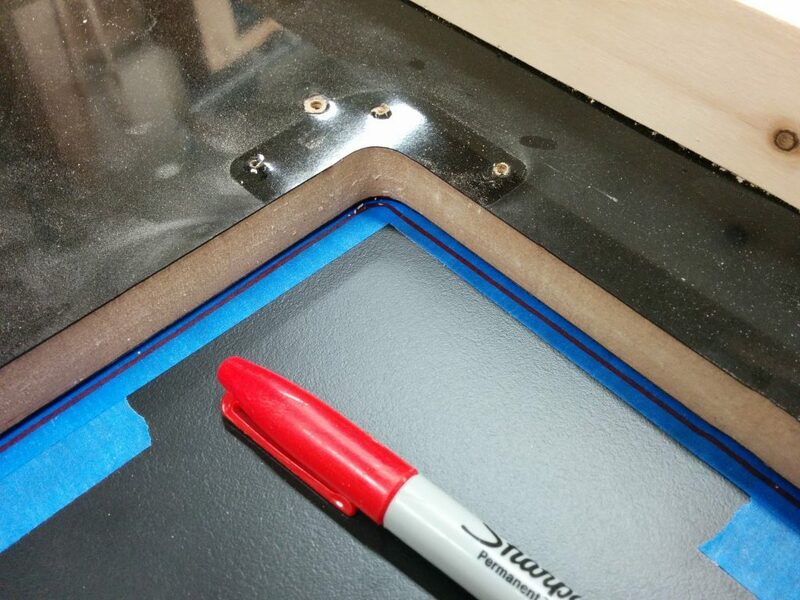 Temporarily marking the inner edges of the template. I then took the template off and ran some strips of painters tape over where the edges will be. The actual edges should be somewhat centered in the strips of tape. Applied blue painters tape over the edges where I will cut out the insert opening. Then I put the template back in place. Again, absolute precision isn’t critical at this point. Set the template in place. I used a red Sharpie to trace the opening on the blue painters tape. Traced the outline of the opening with a red Sharpie. I then removed the template yet again so I can see the outline I just traced. Removed the template after tracing the outline. 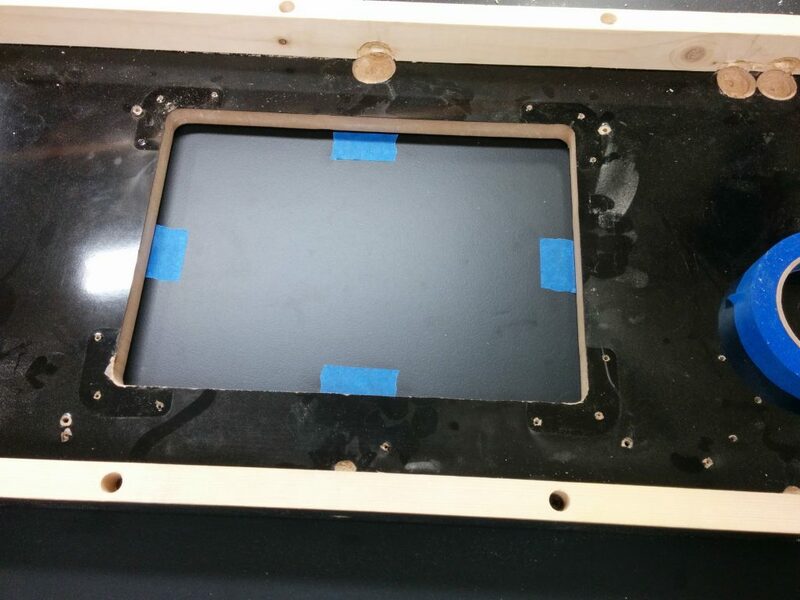 I drilled 1/2″ holes near the inner corners. The holes have been drilled. 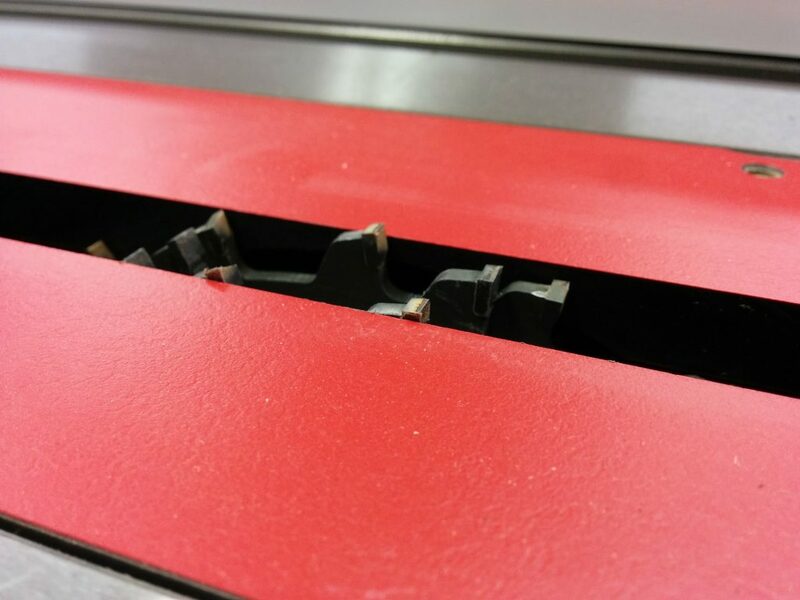 I’m using a jigsaw to remove the bulk of the material, roughly cutting it out about 1/4″ inside the lines. I’m going to rough-cut out the opening with a jigsaw. Nice and sloppy. The critical thing is not crossing over the line. The piece has been removed. 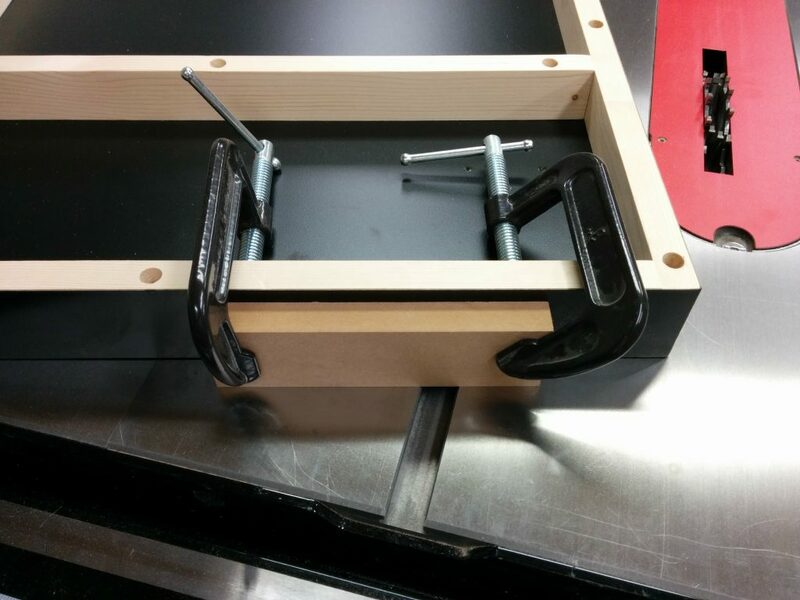 Carefully positioned the left edge of the template and clamped that side in place. 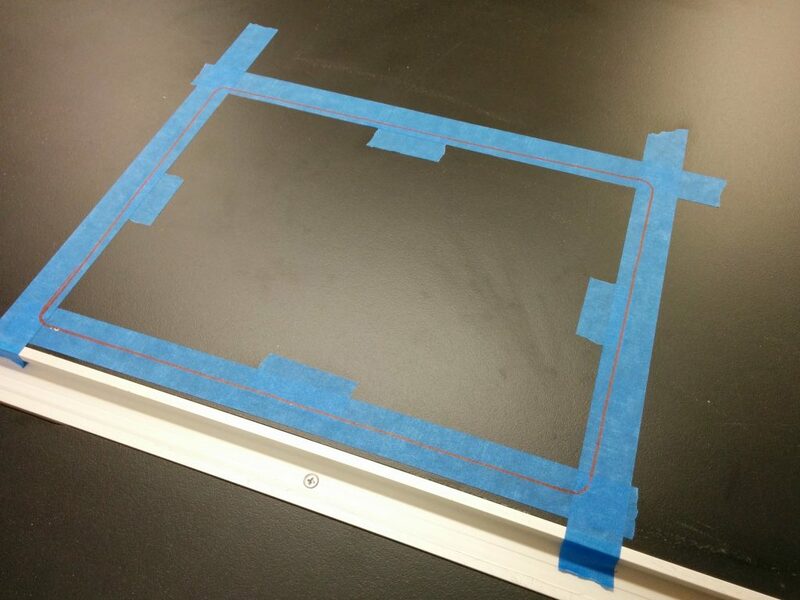 …then used a try square to make sure the template was square with the table. 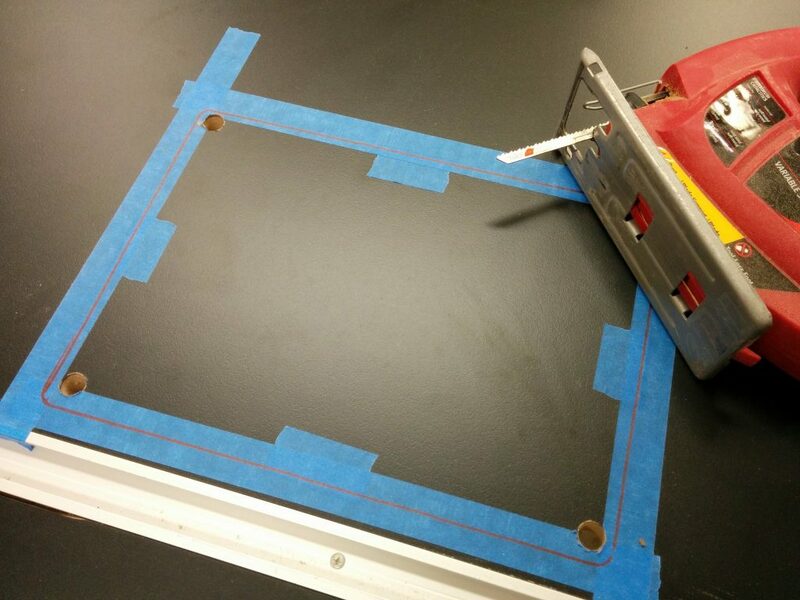 Using a try square to ensure the template is square with the table. Once I was satisfied that it was square, I clamped down the opposite end then applied one more clamp to each edge just for good measure. Carefully clamped the other end in place and secured with additional clamps. 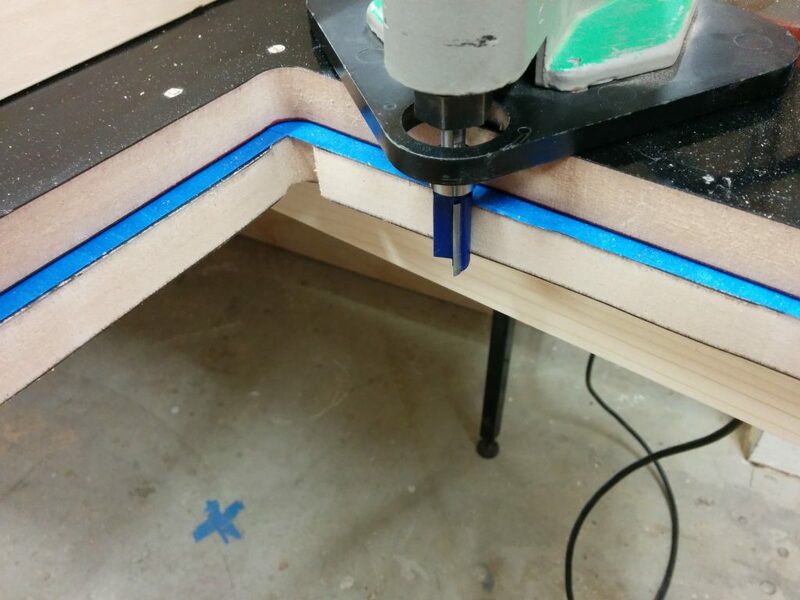 I outfitted my trim router with a 1/2″ pattern bit. Positioning the router to cut out the opening. It was throwing up quite a bit of dust so I set up a dust collection hood to grab most of it out of the air. Getting pretty dusty so I set up my dust shroud. I had a problem with the bearing on this pattern bit coming loose and the whole bit slipping. This caused a little gouge on the inner-right edge of the opening. Chewed up the opening a bit when the bearing came loose. Otherwise, it looks okay. 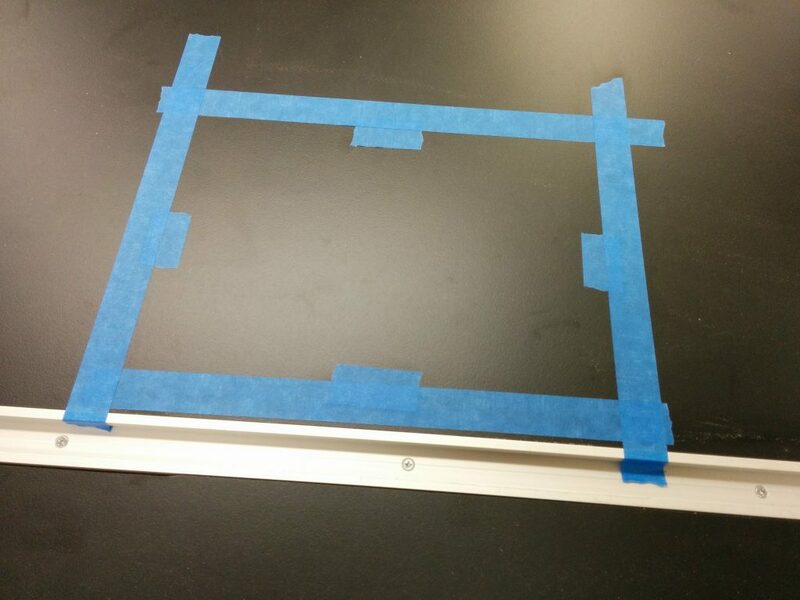 I removed the template and the painters tape so I could inspect the edge. 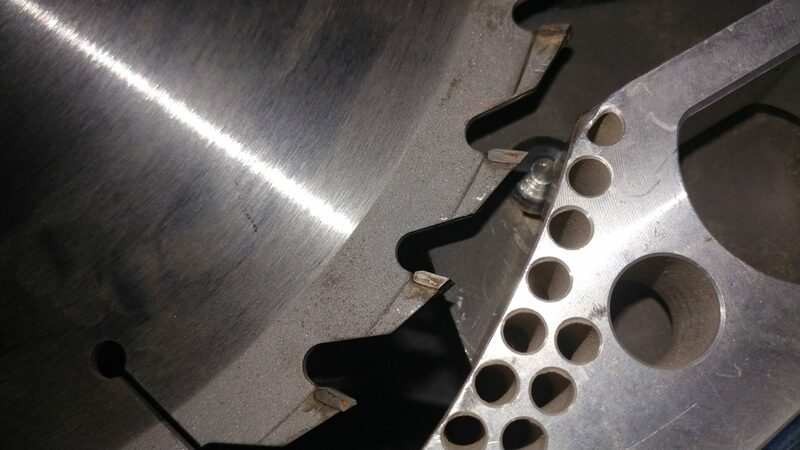 There was a little divot where the bearing came loose but other than that, it wasn’t bad. Removed the painters tape. Other than the small goober on the right, it didn’t turn out bad at all. I used a file to break the edge a bit. Broke the edges a bit with a file. 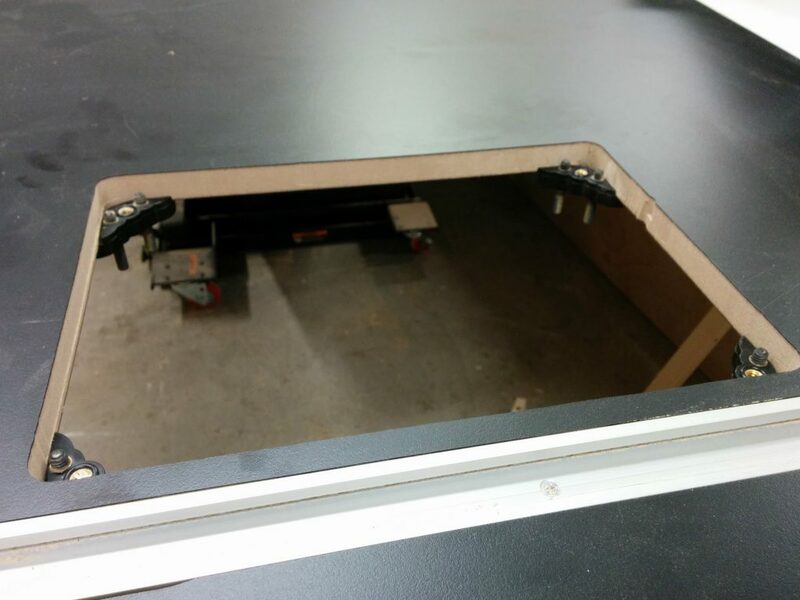 This particular extension table has some support bars underneath. They are only screwed in and are easy to remove. The table braces are going to get in the way so I’m going to move them. 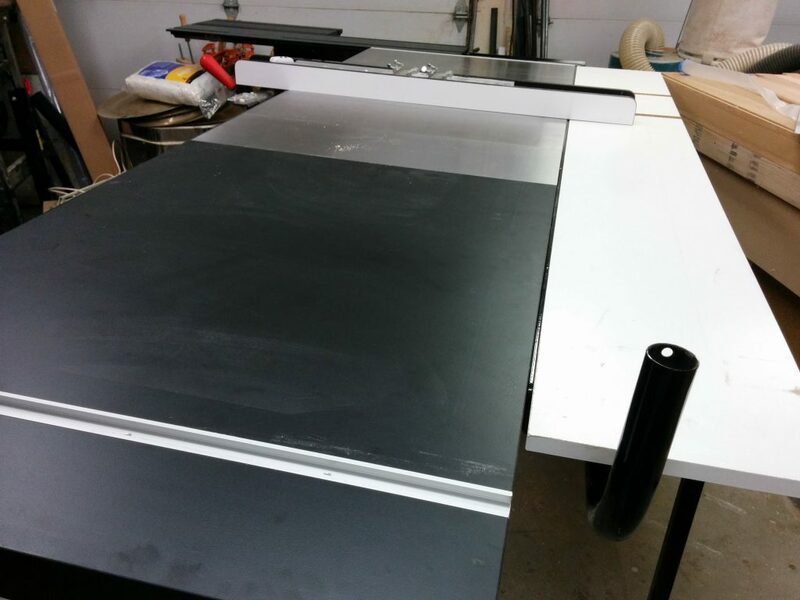 I removed the support bars so I would have room for the Kreg PRS3040 Precision Router Table Insert Plate Levelers which installed easily from underneath the table. 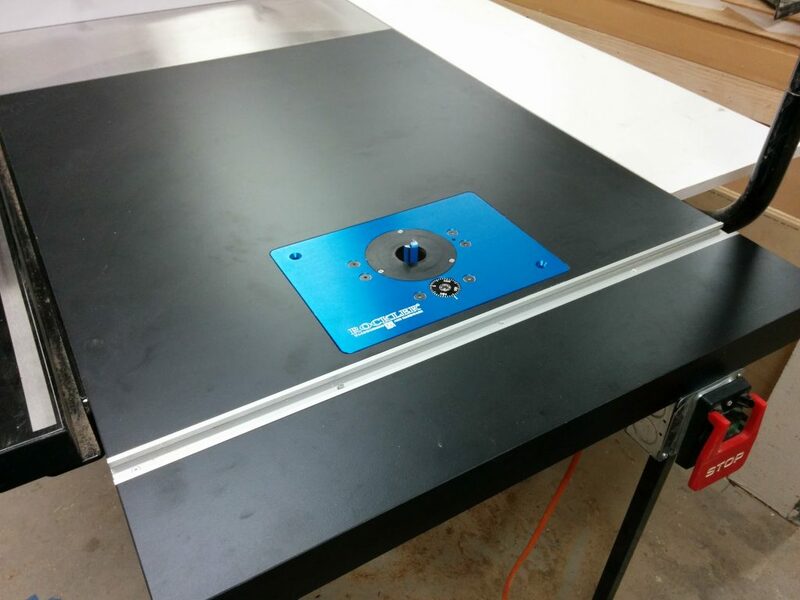 Installed the Kreg PRS3040 Precision Router Table Insert Plate Levelers. 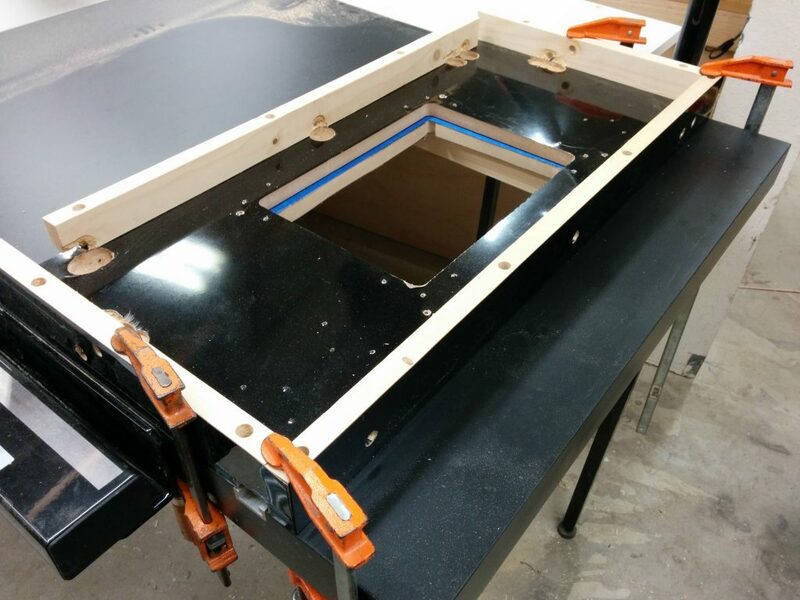 Each leveler has two set screws that are used for leveling the router insert. 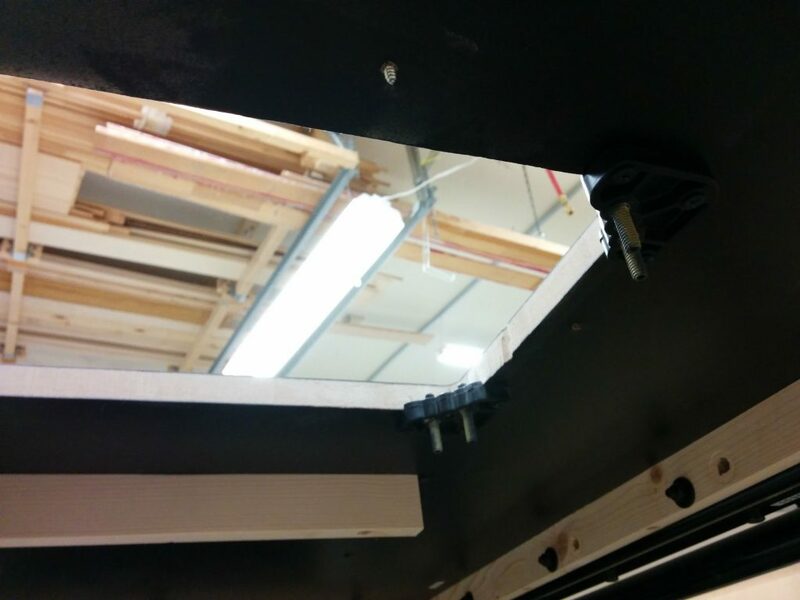 The Kreg levelers went in easily. I reinstalled the support bars. 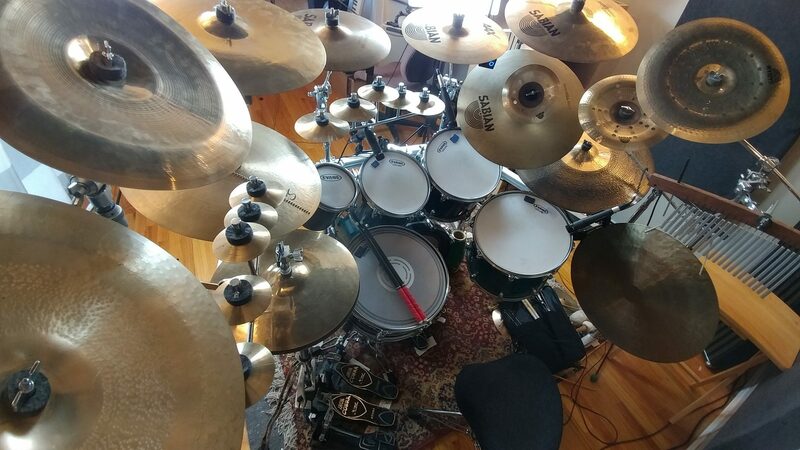 I had to move them by about 1/4″ from their usual spot. I reattached the supports under the table. The next step was to start hooking things up. I installed a 4-outlet electical box that was wired to a motor power switch. I hooked up an electrical outlet and a knee switch under the table. 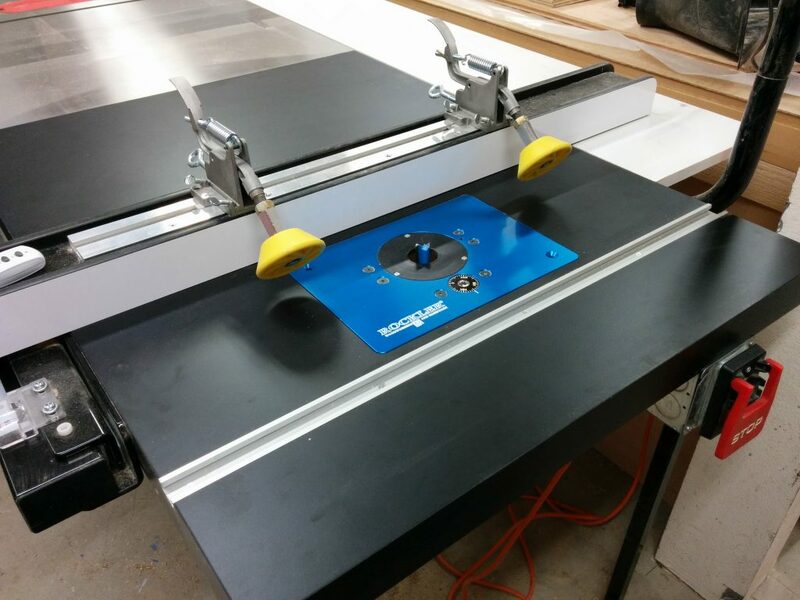 Then it was simply a matter of dropping the Rockler router lift in place and plugging in the router. 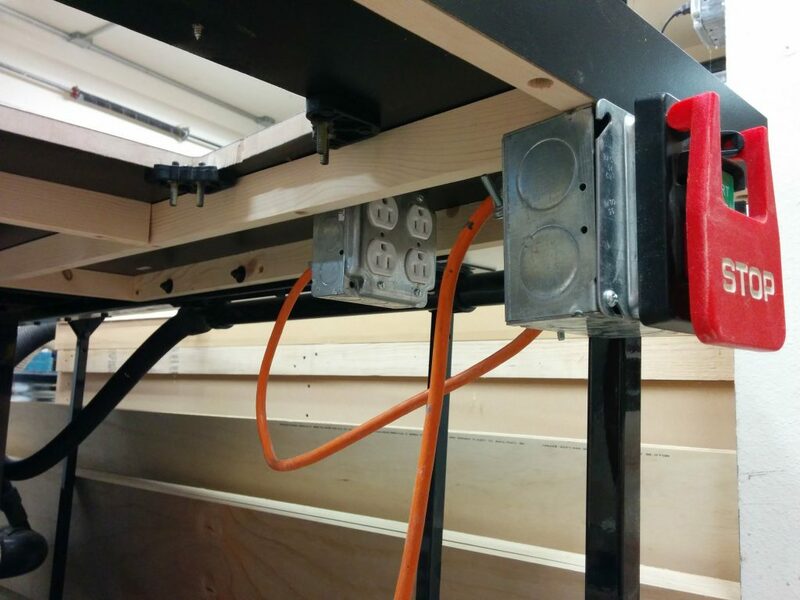 The router lift has been placed in the table and the router plugged into the outlet. A little bit of leveling and I’m all done. 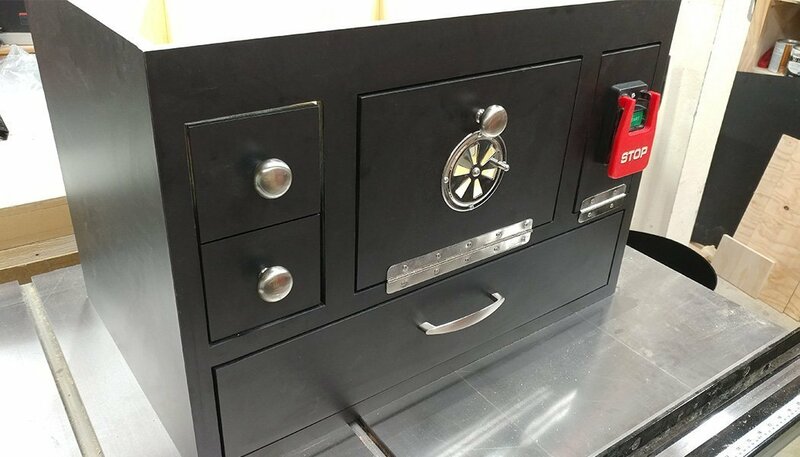 The router table is all finished. 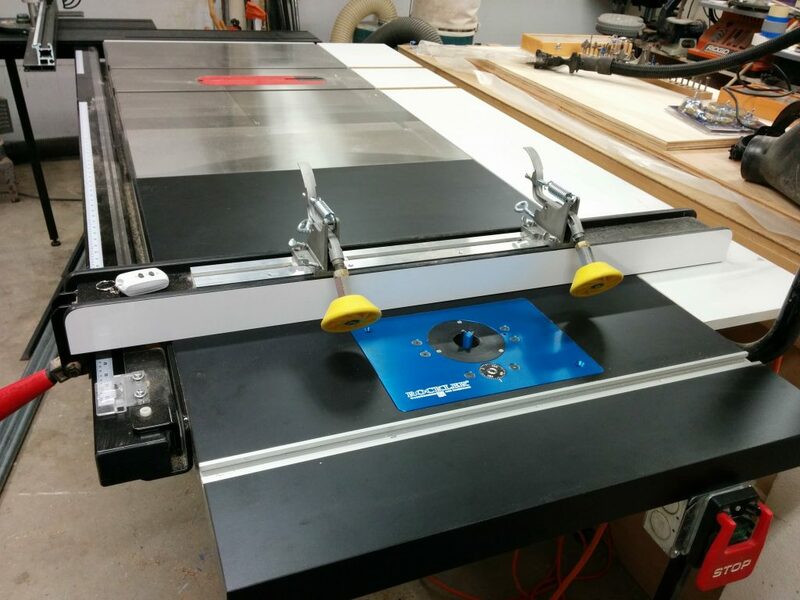 I can use the table saw fence with the router table. This photo shows how close I can get it to the router bit. 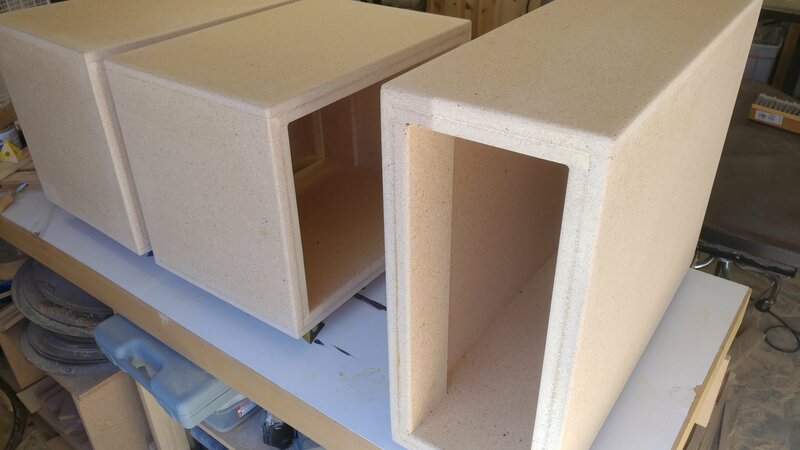 I will be making an auxiliary router table fence with built-in dust collection that I can attach to my table saw fence, but that’s a project for another day. 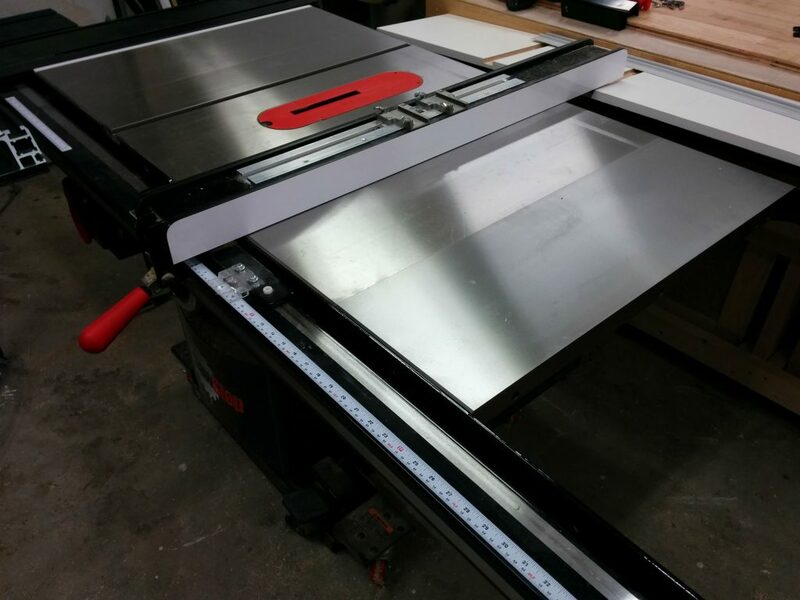 I can use the table saw fence with the router table as well. That’s it! 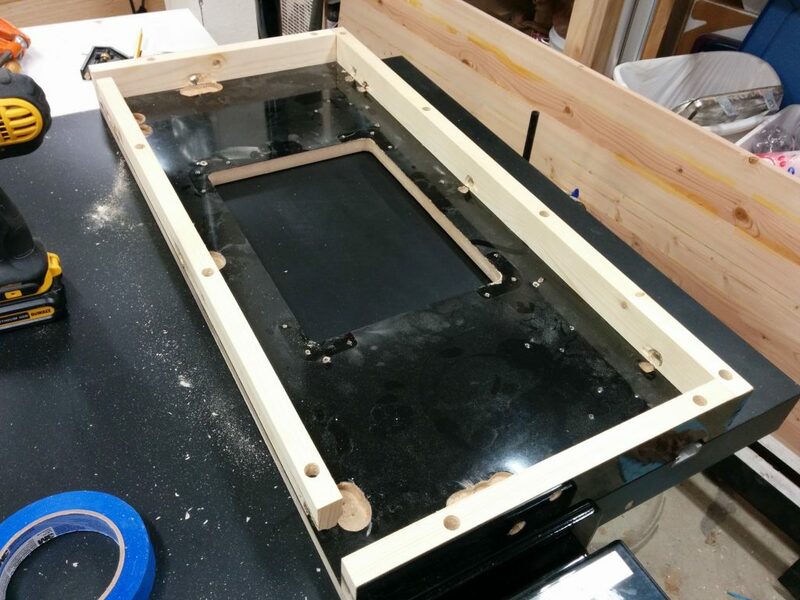 Up next is an enclosure for the router and maybe some drawers for storing router bits. For now, I’ve got some other projects that require my attention. If any of this has been helpful to you, or if you have any suggestions or questions, please take a minute to post a comment below. I’d especially like to hear any suggestions for projects that you’d like to see me tackle. Very detailed info here. I love the mods.